St. Lawrence is a Canadian town located on the Burin Peninsula of Newfoundland and Labrador. As of 2016, the population of St. Lawrence was 1,192, down from the 2011 Canadian Census of 1,244. Popular family names in the town include Slaney, Pike, Lake, Drake and Edwards. St. Lawrence was named by a group of shipwrecked sailors who came to the New Found Land in 1583 with Sir Humphrey Gilbert. During the expedition their vessel, “HMS Delight”, sank off Sable Island. Sixteen of her crew drifted in a lifeboat for 7 days before coming ashore on the South Coast in Little St.Lawrence. Richard Clarke, the Master of the doomed ship, wrote a dramatic account of the event in 1584.1 <"Richard Clarke's Account of the Casting Away of the Delight"(1584) in David B.Quinn Ed The Voyages and Colonising Enterprises of Sir Humphrey Gilbert,Vol.1,London:Hakluyt Society,1940 p423-26>. The area was known to English, French, and Basque fishermen in the 1500s and there were a few French stages at St Lawrence itself, for the early French ship fishermen for the fishing season.2 < Prowse, D. W. (1896), A history of Newfoundland from the English, colonial, and foreign records (A history of Newfoundland, from the English, colonial, and foreign records. ed. ), London: Eyre and Spottiswoode p. 183> However, settlement actually began in the early to mid-1700's. "In the Parliamentary Report of 1718 it is stated that nearly all the Poole vessels engaged in the Newfoundland trade were built in the Colony. Spurriers built barques, brigs,and ships at Oderin, Burin, and St. Lawrence".3<D.H. Prowse. p165.> Captain James Cook surveyed the St. Lawrence area and vicinity in 1765. St. Lawrence was a hive of activity in 1784 when Newmans opened its store in Little St. Lawrence and business was soon rivalling that of St. John's (the capital city.)4<K. Matthews, “NEWMAN, ROBERT,” in Dictionary of Canadian Biography, vol. 5, University of Toronto/Université Laval, 2003–, accessed January 25, 2017, http://www.biographi.ca/en/bio/newman_robert_5E.html.> Newmans closed its Little St. Lawrence store in 1811. Fishing was the main economic activity of the area for hundreds of years due to the proximity of St. Lawrence with the Grand Banks. A tsunami devastated the area following the 1929 Grand Banks earthquake; 27 people lost their lives, and many along the coast lost their houses, boats, stages and supplies. This added greatly to the hardship already inflicted by the Great Depression and the collapse of the saltfish trade. Fluorspar deposits had been noted as early as 1843 but it was not until 1933 that mining began. The Fluorspar mine in St. Lawrence was a major employer in the community until 1978, when the mine was closed by Alcan. In 2011 Canada Fluorspar Inc. outlined preparations to open a fluorspar mine on the site of the old mine. As of 2016 the project has still not commenced. A wind project has recently been initiated by the Government of Newfoundland and Labrador for St. Lawrence. The project has resulted in the installation of nine Vestas V90-3MW wind turbines. home of the wild brud as well. The recent development of offshore oil in the nearby Grand Banks area has not affected St. Lawrence much. On February 18, 1942, more than 200 American sailors died when the USS Truxton ran aground near Chambers Cove and the USS Pollux ran aground at Lawn Point. Tremendous community efforts and personal bravery by the citizens of Lawn and St. Lawrence reduced the high death toll. In 1954 the U.S. Navy built a hospital at St. Lawrence in gratitude for their work. In 1992, a memorial entitled 'Echoes of Valour' was erected in dedication of the mining industry in St. Lawrence, the sailors who died in the USS Truxtun and USS Pollux disaster, and those who lost their lives in the World Wars. St. Lawrence has a K-12 School, St. Lawrence Academy. The school was initially the high school for the town "St. Lawrence Central High School". With dwindling enrollment in the 1990s the school was renamed St. Lawrence Academy and encompassed k-6 upon the closure of Marion Elementary in 1999. St. Lawrence has been referred to as the 'Soccer Capital of Canada ' and ' Home of the wild Brud '. St. Lawrence Centennial Soccer Field has been listed on the Historic Places in Canada since 2005. The St. Lawrence soccer teams have been a powerhouse of soccer both on the Burin Peninsula where they have dominated. As well at the provincial level success has also been achieved culminating in the Laurentians being named the "Team of the Decade" for the 70's and 90's. The town has nine organized soccer teams. The St. Lawrence Laurentians soccer club is the most recognized. 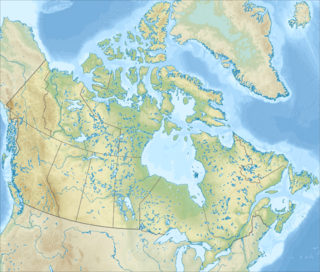 ^ Environment Canada—1961–1990. Retrieved 16 October 2012. St. Lawrence - Encyclopedia of Newfoundland and Labrador, vol. 5, p. 39-41. The Gulf of Saint Lawrence is the outlet of the North American Great Lakes via the Saint Lawrence River into the Atlantic Ocean. The gulf is a semi-enclosed sea, covering an area of about 226,000 square kilometres (87,000 sq mi) and containing about 34,500 cubic kilometres (8,300 cu mi) of water, which results in an average depth of 152 metres (499 ft). Lawn, population approximately 670 as of 2011, is located at the tip of the Burin Peninsula on Newfoundland's South coast, Newfoundland and Labrador. Lawn is spread around a small harbour in a relatively lush valley. According to one local tradition it was this lushness that inspired Captain James Cook to name the place Lawn Harbour. But it has also been speculated that a Frenchman named the community after a doe caribou that he spotted there. Grand Bank, Newfoundland and Labrador, Canada or 'Grand Banc' as the first French settlers pronounced it, is a small rural town with a population of 2,580. It is located on the southern tip or "toe" of the Burin Peninsula, 360 km from the province's capital of St. John's. Grand Bank is a defunct provincial electoral district for the House of Assembly of Newfoundland and Labrador, Canada. Prior to the 1974 redistribution, the district was called Burin. The district was abolished in 2015 and replaced by Burin-Grand Bank. The Burin Peninsula is a peninsula located on the south coast of the island of Newfoundland in the province of Newfoundland and Labrador. The second USS Pollux (AKS-2) was a Castor-class general stores issue ship. Burin is a town on the Burin Peninsula in Placentia Bay, Newfoundland and Labrador, Canada. 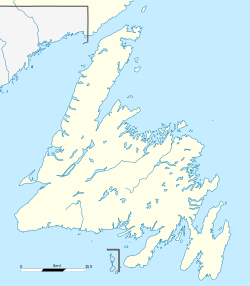 The Burin Peninsula is often affectionately nicknamed "The Boot" due to its resemblance to the footwear when seen on a map, with the town of Burin located near the "heel". Burin is approximately 318 km from the capital of St. John's. Settlement in Burin dates to the early 18th century, although documentary evidence indicates that French fishermen had been fishing and exploring the area even earlier. The 2016 Challenge Trophy is the national championship for men's soccer clubs competing at division 4 and below in the Canadian soccer pyramid. It will be held in St. John's, Newfoundland from October 5–10, 2016.